When I find something that can cover multiple needs I take notice, and in Palladium Boots - recommended by a friend - I have found a brand that I could buy nearly every pair of shoes (other than athletic) that I might need now and in the future. Palladium is a French company with roots are in tire manufacturing for the aviation industry in the 1920s. After World War II they moved on to use their expertise with rubber and canvas to make shoes for the French Foreign Legion - the boots that serve as the inspiration for all their footwear. 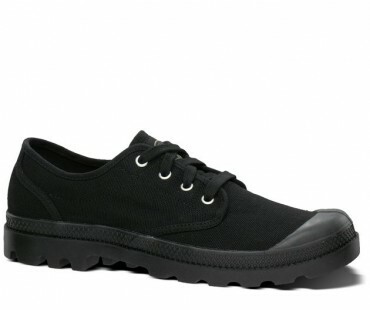 Palladium has made shoes with a classic style that can work with many different styles and levels of dress. From one line you can get boots or shoes on leather or canvas, even plaid wool, that can go from rugged outdoor use in their Tactical boots, to casual jeans in canvas lo shoes, to their leather oxfords and Pallabrouse boots (reminiscent of something by Kenneth Cole or Steve Madden) you could get away with in a more business attire fashion - and that is just in their Pampa line. They even recently added a Lite fabric in addition to their regular canvas for not only a casual but also a Summer moisture-wicking fabric for warm weather. The first shoes I ordered from them are their canvas oxfords, in stonewashed black, as seen to the left. OK so admittedly their canvas line of lo or hi shoes can seem like Converse Chuck Taylors on steroids (down to the rubber circle logo on the side of the high tops), but these are real shoes, they are oxfords and not court shoes. You can tell they know their rubber by the quality and durability of the soles which I would compare favorably to Doc Martins. The canvas is high quality and the stitching is not going to fray or come undone. Inside the shoe the two-piece; hugging heel cup and thick die-cut EVA seem like the came out of an athletic shoe for long term high use comfort. These are the most comfortable shoes I have ever worn including track and cross country shoes and walking and hiking shoes. I will likely over time get at least 3-4 pairs of Palladiums in different heights and materials to cover a wide range of styles and uses. Perhaps the best part of Palladium? The price. These are truly affordable, high quality shoes, from a low $50 for canvas los to $110 for the leather Tactical boots. Next time you are looking for new shoes I highly recommend checking out what Palladium has to offer.